14 days later, it arrived. It wasn't a picture perfect moment like I expected. I decided around lunch time to get dressed and bring Husband some lunch at work. So, I corral the puppies into our room as I get the shower ready. Out of nowhere, they start barking. Since that happens way too often, I almost thought nothing of it. But something stopped me and made me think I should check things out. Not being one to waltz around the house in my birthday suit, I grabbed a towel and headed for the front door. Peeking out the peep hole, I see the mailman writing one of those "Sorry we barely tried to get your attention! Sorry you can't have your package you've been waiting for! Here's your impossible task to retrieve your treasure. Good luck! Oh, and you have 3 tries" notes to leave on our door. Freaking out, I remember I can't open the door because I'm in a towel. I mean, ran back to the room to find something that resembled clothes. When I finally got outside, mailman was 4 houses away. I screamed for him every time he stopped. Yes, I ran after the mailman. Wearing clothes I wouldn't normally dare wear in public. Neighbor's annoying puppy chasing me, chasing the mailman. Yes, one block away, he finally saw me. 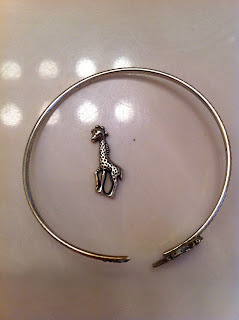 This bracelet had the nerve to break after all I've been through. Little giraffe couldn't take it anymore and popped right off. I have been through the full spectrum of emotions with nothing to show for it. P.S. It did come with a cool ring as a gift, which is super cool, but doesn't fit any normal ring fingers, and doesn't fix my bracelet. 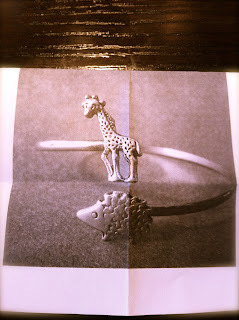 Thankfully, Husband is a pro at giraffe rescuing/gluing and promises to put this little guy back where he belongs. Our life has been non-stop since you finished school and we packed up and headed to Tennessee. I am so proud of you. I know you hated school because your heart was already full-time in youth ministry. But, you knew that to support our family, you had to finish your degree. I am so proud to call you mine. I don't tell you near enough. You always have a positive, stress-free outlook on life. So different than me. So perfect for me. I am in love with our new life here in Tennessee. I always told you we'd end up in the mountains and I'm so happy God loves me more and listened to me (okay, not really.) I'm thrilled you get to wake up every morning and spend the day at your dream job. You deserve it. Your heart for people is crazy big. You take time to make sure everyone in the room smiles. God has already done amazing things in your life and it blows my mind to think that He is nowhere near finished with you. I love you, Handsome. Thank you. Thank you. Thank you. Brandon and I have never felt so overwhelmed by God's peace and love in one place. You have all taken us under your wings and made us feel at home from day one. God has been moving in a mighty way in our lives and we are so ecstatic that He brought us here. To our youth group, we love you guys so much. It's only been 2 months, but you have already made such an impact on us. You probably won't understand why, unless you know our own personal testimonies, and I hope one day will be able to share with you how God brings us through fires to purify and bring Him glory. I cannot wait to spend the next how-ever-many years getting to know each and every one of you. I know God moved your son and daughter 7-10 hours away from you, but I promise it is all a part of His plan. We miss you guys something fierce and can't wait to show you around our new hometown. Thank you in-loves for bringing up a wonderful man. Thank you Mr. Rick for showing Brandon how to treat women with respect and for giving him a gentle heart. Thank you Mrs. Angie for showing Brandon love when he needed it the most and for keeping him focused on what truly matters. Thank you both for letting me into your family with open arms. Thank you Mom for giving me your smile and humor (I know we are funny.) Thank you Dad for giving me your passion and constantly showing me as I grew up how my future husband should love and treat me. We miss both our moms and dads and we love you guys very much. Sometimes I don't even know where to begin. You have brought me personally through so many trials. I wish I could say that my faith remained strong, even when faced with terrible medical issues, even when faced with horrible persecution, but sadly I can't. I know now that You had to grow me. I know that you had to allow these trials in my life so that I would become so broken, I couldn't lean on anyone but You. So, thank you. Thank you for allowing me to break. But more than that, thank you for not leaving me broken. You picked up my pieces and molded me into a new person. I now have even more to add to my testimony, not for sympathy, but for declaring Your wonderful goodness. I pray you never stop breaking and molding me. If you must know, I'm in the bright pink sweatshirt on the left. Husband is standing on the stage on the right. 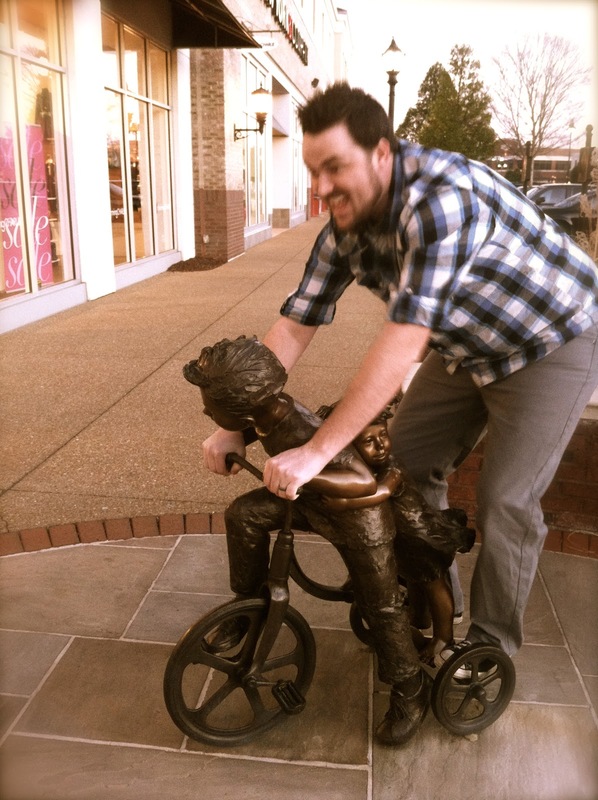 Never a dull moment in youth ministry. 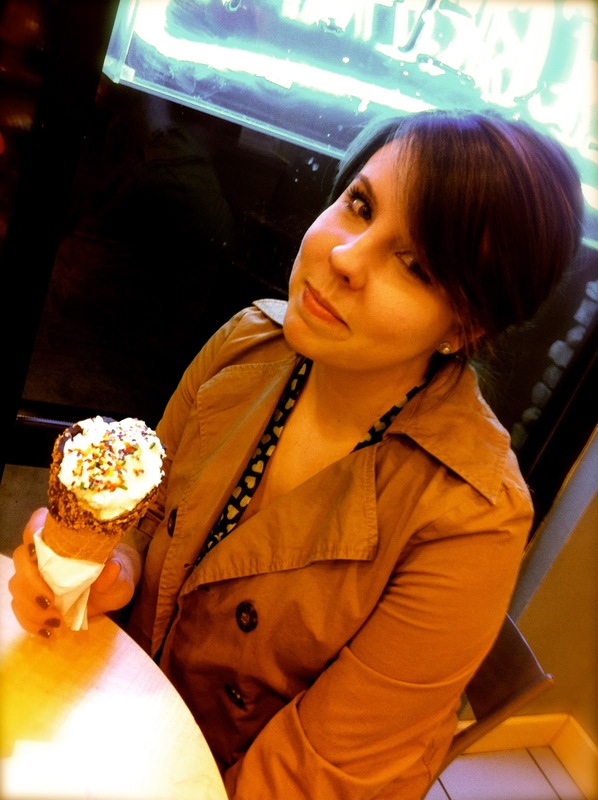 *aaand, I (think) I successfully made a button for my blog. Check it out and hope it works! Life lately, captured by everyone's favorite app. Have you guys tried the new app, Vine? It's pretty awesome. Check it out and find me! Movie night with Husband, Mrs. Doubtfire. I spent hours putting together our budget, finding recipes, organizing shopping lists, etc. Husband took Olive out to play disc golf. He left Bailee with me and she was so heartbroken. Shopping for a youth work day. Had 50 sodas in my cart...didn't tempt me at all! Bailee girl chillin' with her dad. Youth work day! Felt so good to go through junk and organize everything. Then, Husband took Bailee out and left Olive. Ohmylanta. She's worse than Bailee. Drama Queen. We had snow flurries and pretty ice this weekend. Pretty sure Girl Scouts are angels. These are clearly from Heaven. Why is the avatar me prettier than the real life me? Subbed for the first time on Tuesday! Loved it. Doing it again tomorrow! This needs to happen. Also, the girls who raise their eyebrows for every.single.picture. Not cute. Yes, I have a Giga Pet on my phone. InLOVE with my new TOMS sweatshirt. Still wearing it. Day 3. Is that weird? Best Skype date ever. My parents are THE best. And my Bella-Boo. Love them. I'm back with another one of my epic "how to" posts. This time, it's the dreaded laundry/hanging clothes/purging your closet chore. As always, music is a must. Pop in your favorite cd. Click on your favorite Pandora station. Set the mood. And don't be afraid if you start dancing. That's totally normal. An audience makes any mundane chore seem like a performance. I prefer two, small, non-talking, covered in fur, onlookers. They don't criticize your methods or dancing. Wash your clothes. Dry your clothes. Pile them on to your bed. This works best when you've waited entirely too long and have about 10 loads of laundry to go through. Brand new, bright red hangers always make things happier. You can buy about 1,000 for 50cent at Walmart. Something like that. You need a closet, clearly. This is pre-decluttering, so excuse the broken shelves and lack of organization. The best way to force yourself to stay inside and do chores is schedule a cold, rainy day. These days are my favorite, so it cheers me on even more. Rule number one: get comfy. 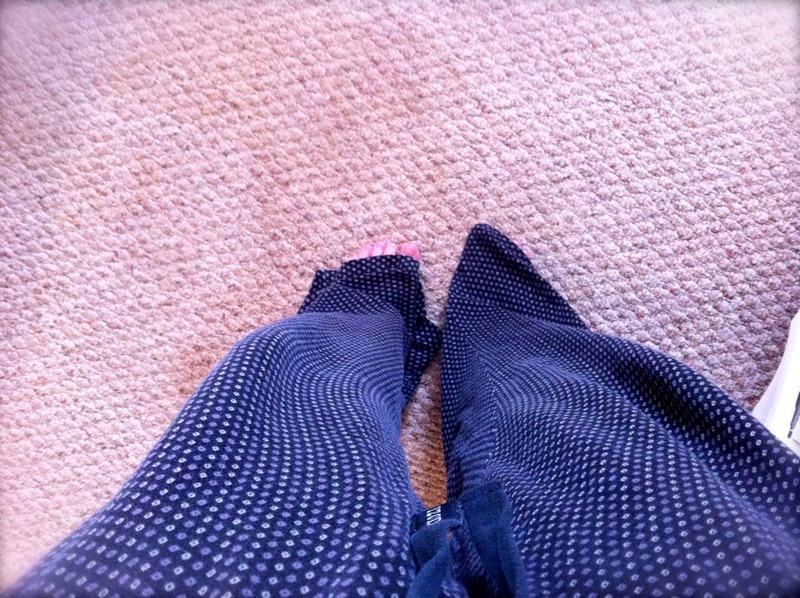 Husband's oversized pajama pants are my first pick. 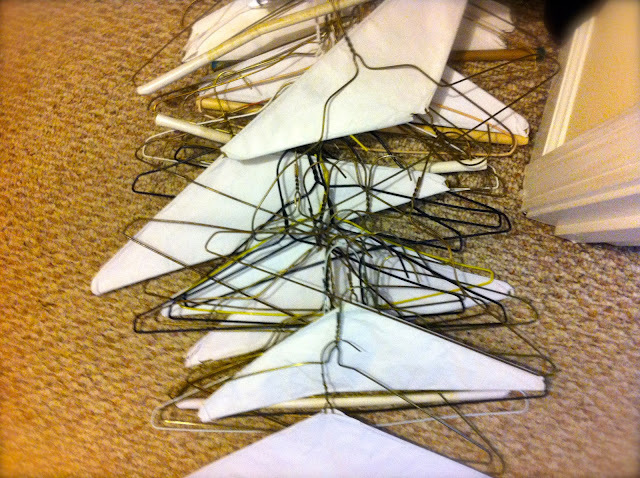 As you are hanging up your clothes, go through your closet and get rid of all the wire hangers. Replace them with your new colorful ones. Keep hangers in a neat pile (is that even possible?) because you just know you're going to use them for one of your Pinterest projects. Yeah right. Don't forget to break frequently. This is not easy stuff. Do not overexert your body. Drink lots of water. Take cute pictures. Enough break, back to work. Make a pile of clothes you are ready to give away. I give away anything that a) doesn't fit right b) I never wear c) I just flat out don't like and never understand why I bought it in the first place. I did this last week and between Husband and I, we got rid of three large boxes full of clothes/shoes. Took forever. Felt so good. I hope this motivated you to stop putting the dryer on it's third round of drying, buy some new hangers, and get your closet organized. to post on something almost a week after it happened. But it's my blog and not yours. I just had to let it soak a few days before I could fully write about it. Or, I'm lazy and forgot. We'll go with the first one. I am one of those super girly girls when it comes to most holidays. I love going all out. I love getting all dressed up. I love giving and receiving gifts. And this year, Husband and I had the best Valentine's celebration in our new hometown. I woke up sick (not fun or fair) while Husband left for work. 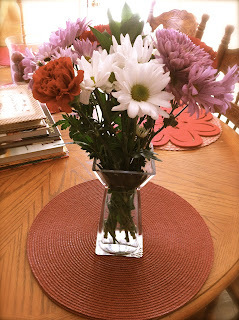 He came home during lunch and surprised me with these gorgeous flowers. 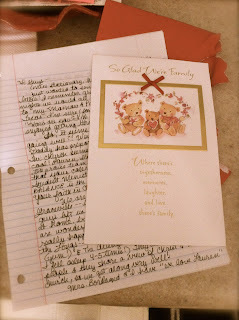 Then, I checked the mail and found the sweetest card from my parents. Plus, a handwritten note from my mom. The best. Dinner was at my favorite restaurant, Carrabba's. There, Husband handed me a card and two folded sheets of paper. 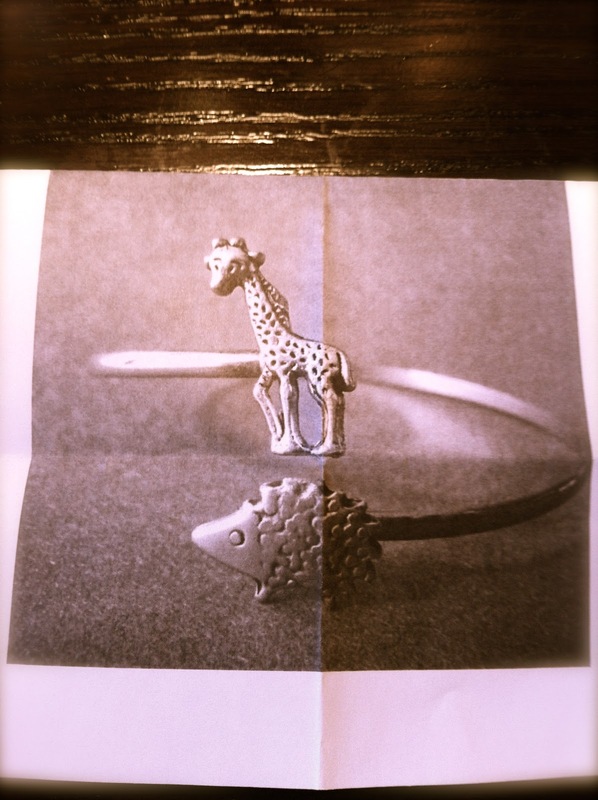 The first one was a picture of a giraffe and hedgehog bracelet. If you know me, you'd understand how perfectly random it is. My favorite animal is the giraffe and I have been begging Husband to get me a hedgehog. 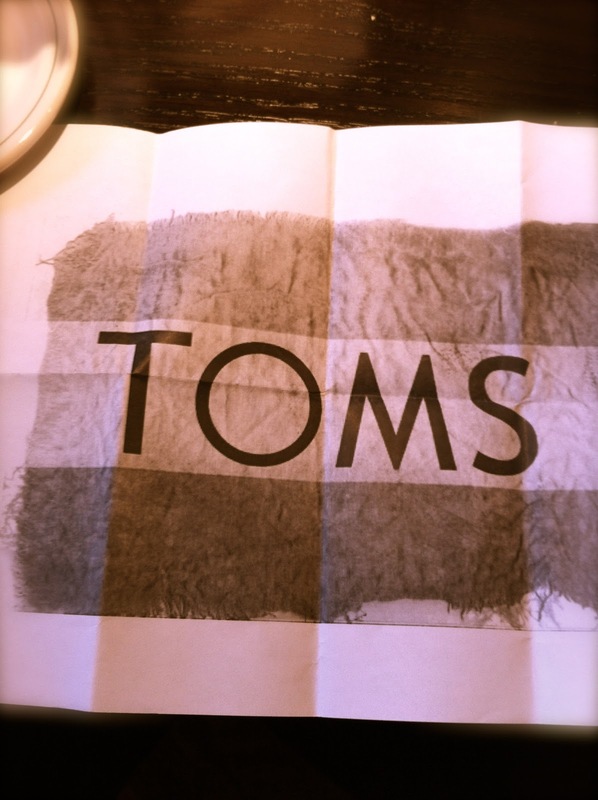 As if that weren't enough, I opened the second sheet of paper and saw the TOMS logo. I can finally buy the sweater I've had on hold for 2 years! After dinner, we took a stroll around the shopping center and then stopped for ice cream. We failed for not taking the standard Valentine's couple picture. Our perfect day ended snuggled on the couch, watching a scary movie. Hope you didn't gain too much weight from all the sweets. We are the blue dot. 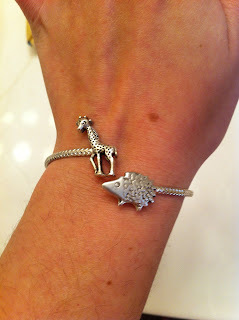 My bracelet is across the world. These are random thoughts running through my mind. We have officially been TN residents for over a month now and I couldn't be happier. My only issue is having 2 measly days of snow. Now that I'm aware of what TN is capable of, I don't understand why we can't have that more often. Speaking of curtains (just go with it.) Our living room is my favorite place. I'm so proud of how the decorations have come together. There's just one thing missing...curtains. It drives me crazy. Not only are most curtains expensive, there are so many choices! I want these curtains to make a statement in my living room. Oh, the troubles. I have come to the realization that I am about as domestic as a toddler. Scratch that. I think the preschoolers can make yummier meals and play house on the playground better than me. I wish I had the skills to sew like crazy. Then I could make my own curtains and not have to buy many clothes. And then there's cooking. Don't even get me started. I have about 3 things I can successfully make. Chili, scrambled eggs, and brownies. That's it. Truly, for real, not joking...that's it. Poor Husband, I have completely failed as a wife in those areas. Going grocery shopping intimidates me. What are the main things every house needs? I don't know! How do you go grocery shopping when you don't know what you need? Are you supposed to have tons of recipes memorized so you automatically does on the list? Clearly I need help. I need a grocery fairy. And a cooking fairy. And throw in some money while you're at it. I want to lose weight. I want to work out. I want to eat healthy. Yet, I'm so overwhelmed I do nothing and feel miserable. I think I want to dye my hair red. Valentines day is coming up and I am kind of dreading it. I become this crazy hopeless romantic when it comes to gift giving and receiving. I imagine these wonderful, romantic, unattainable gifts that inevitably let me down when I receive or give to others. I need to realize every present, big or small, is special and thoughtful. I also need to calm my imagination down. Most people truly just want to know you thought of them. I feel as thought I have to prove my love for them in crazy big ways, therefore I expect the same. It's not a good habit. I'm working on that. I hate doing laundry. No, more than hate. I loathe. Super loathe. I'd rather get rid of all my clothes and keep 7 outfits to rotate. Hmm, maybe. Confession: I watch The Bachelor. There, said it. If you also watch this trainwreck of a show and don't know why, visit Alycia at (The Crowley Party) She has the funniest recaps of all the episodes. She gets it. She gets me. I miss having my brother nearby. He is truly one of my best friends. Even though he is younger than me, he is a worthy role model in my life. No one can make me laugh like him, or get me angry like him. I was spoiled these last few years to have him live in the same city. Now, I miss him like crazy. We still talk almost every day via Facebook and texting (most of our conversations are about new YouTube videos and Downton Abbey.) It's just not the same. I love you, Brother! Now I feel all sappy. Stupid. "Sunday morning rain is falling..."
Few things are better than some Sunday rain. And having Maroon5's voice stuck in your head all day isn't so bad either. it snowed last night and we have a birthday boy!